as a free and easy way to get into astronomy. Join Today! INTECH is our FREE OBSERVING site, but offers no facilities so there is no charge. It's a great place to learn astronomy. We observe here once a month on either a Tuesday or Thursday. Here we use the smaller telescopes for practice and induction. We have current suspended new membership for INTECH for the 2013 Season. Its location does have limitations regarding some light pollution and air traffic, but will still be 2-3 magnitudes better than most suburban locations in the South of England. With Mag18-20+ dark skies it's good for general observing and general astrophotography. 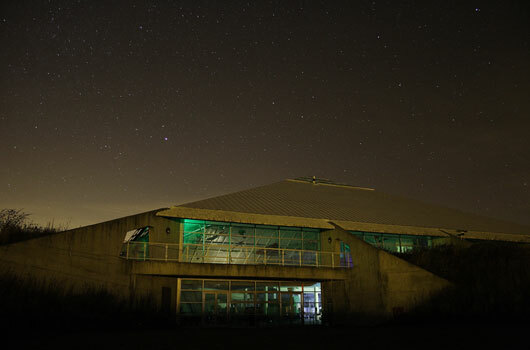 HantsAstro has permission for observing in the grounds after hours, but please note that there are NO facilities at the site during observing sessions. Did you know that INTECH has the UK's largest capacity planetarium? The enormous tilted dome screen completely surrounds you, placing you right in the action. Relax back into your reclined seat and fly through the solar system, visit a black hole, or find out what you can see in the sky tonight. Both pre-recorded and live shows are shown and it's well worth a visit. Their Space Lectures are also worth attending. Their new postcode - SO21 1HZ - may not be recognised by some SatNavs. If this is the case, try SO21 1HX or search by road name (Telegraph Way). They may be allocated as being in Easton. Look out for the brown tourist signs directing you to INTECH. Come off the M3 motorway at Junction 9 and take the exit A31 Alton/A272 Petersfield at the roundabout. At the next roundabout turn left onto the B3404 Winchester, one hundred metres on the left is the entrance to INTECH. The Holiday Inn Express is on the corner. Follow the road around past the Holiday Inn Express and continue past the INTECH main entrance and go towards, the loading bay area where you'll see our signs. After you have parked up follow the path round the left side of the building to the east side area where we will be observing. Come off the M3 motorway at Junction 10 and take exit A31 Alton/A272 Petersfield at the first roundabout and go under the motorway. At the next roundabout go straight across, signposted A31 Alton/A272 Petersfield. At the next roundabout turn right, signposted A31 Alton and A272 Petersfield. Watch Martin Sabin-Smith's film of our Jan 2009 event, which went ahead despite poor weather. Bring your kit to INTECH for free advice on how to get the best from it. Arrive any time from 6:30pm for this drop-in event. Volunteers from regional astronomy societies will help you use your equipment for an early evening observation on the INTECH terrace. While you're here, try out other equipment, get advice on what to buy (or not to buy! ), and find out about local astronomical societies. INTECH's friends, the online astronomy group HantsAstro, will be at this event - ask them about their free observing nights at the INTECH site! Please ensure children are supervised at all times. Also be aware that most of the equipment on display will belong to our visiting experts, so please ask before you use it. No tickets for this part of the evening - just drop in anytime from 6:30pm to 8:15pm. Reflectors, Dobsonsians Refractors and SCTs. See them all, discuss and learn. We'll be bringing a few of our 'Big Guns' to the show... And you thought we only did small telescopes! The INTECH cafe will be open during this event selling baked potatoes, hot drinks and more. Live planetarium show with Pete Lawrence and Ninian Boyle. A trip across the night sky, showing you what to look out for through the coming months. Featuring objects visible to the naked eye or with binoculars and small telescopes. Tickets for the show are £6.50/£5.50 (concession for seniors and those in full-time education). We strongly recommend booking your tickets early on (01962) 891925 as this event is expected to sell out. No late entry to the planetarium. As this show is part of their monthly Space Lecture series, you can book your ticket with other lectures using their 5-for-4 special deal. See Space Lecture webpage for details. "This has been an exceptional opportunity to get good advice and guidance to use a telescope and fuel interest in astronomy. Brilliant evening. Do it again"
"I thought it was all very good - especially the chaps showing us the telescopes! They were great and full of knowledge"
"Excellent night and very interesting"
"Would be great to run this event 4 times a year - to show highlights of each season"
"There were star constellations that I hadn't even heard of, now I can boast at how I can see Orion"
Please note this event is for those aged 8yr+ only. Younger children will not be allowed entry.